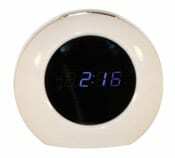 This small LED table multi function alarm clock records video and audio to the mini DVR inside the clock. It records to a micro SD card and runs on a Lithium battery. The battery will run for about 12 hours before it needs to be recharged. The video quality is amazing 1280×960 at 30 frames per second off this tiny little camera hidden in the clock. It is very easy to operate with the remote control provided. The DVR has a motion detection feature so video will only record when there is movement in the viewing area. The wide viewing angle 140° helps give you more coverage than most hidden cameras. This alarm clock is small and portable you can take it just about anywhere.